wow - a week I'll not forget in a hurry. We recorded all the voices in 3 days and then edited them and stuff in 2. Just home now. Guts busted- must be the stress! But it was tremendous fun too as Father Ted would say. Katia, Paul, Fabrice, Nora , Kairen and myself were there for the records. Then just myself and Nora and Kairen did the editing with the engineer a "sound" guy called John (pun intended heh). We were in Ardmore sound, Tom Caulfield and Barry O Donoghue called in for some of the sessions, it was good craic overall. Liam Hourican was really cool as a lot of the extra brothers - particularly leonardo. The voice he did for Friedrich was so funny I cryed my contact lens out! Paul Tylac did some great stuff as Assoua as well, very big and booming stuff. Brendan Gleeson did a great performance on Monday , he really got into the character and asked a lot of questions and found really interesting takes on the lines. He gave the character so much authority. Mick Lally and himself seemed to really get into the parts, acting them out physically as well and with their voices. Brendan Gleeson is such a big guy it was cool seeing him acting opposite little Evan. He really made the character his own and really made him come alive. Mick Lally WAS Bro.Aidan, even his mannerisms between takes were very inspiring for the character. He really loosened up the dialogue and was very interested in the character. He even said he did'nt think Bro.Aidan would refer to St.Colmcille as "saint" because he probably knew him! It was a cool little insight that will be bring a subtle depth to the character. Mick had a bit of a head cold, but we thought it will be a neat thing to bring into the character animation, making him more grounded and "in" the world, I started sketching Bro.Aidan sniffing and sneezing and stuff as Mick did his performance. As all the actors were roughly the age of their characters and also roughly the same build and so on, it was kinda like seeing a real-life representation of them in front of us. Fabrice shot soem reference footage which will be fun to use in the animation. Evan McGuire our 11 year star was really great , and the scenes where he played against Brendan Gleeson and with Mick Lally had me shivering, it was so cool to hear so much life put into the lines we've picked at for so long. Christen Mooney was really fantastic as Aisling, she was really brilliant, had all her lines off by heart and considering she's only been on the planet since 1998 its amazing the understanding she brought to her character! Nora helped get to some of the trickier lines, and listening to them back today it was really exciting. It was cool to hear it back like a radio play, but strange too, because characters like Pangur and the vikings and stuff were conspicous in their absense! Its gonna all come together only with the pictures and thats as it should be in animation. 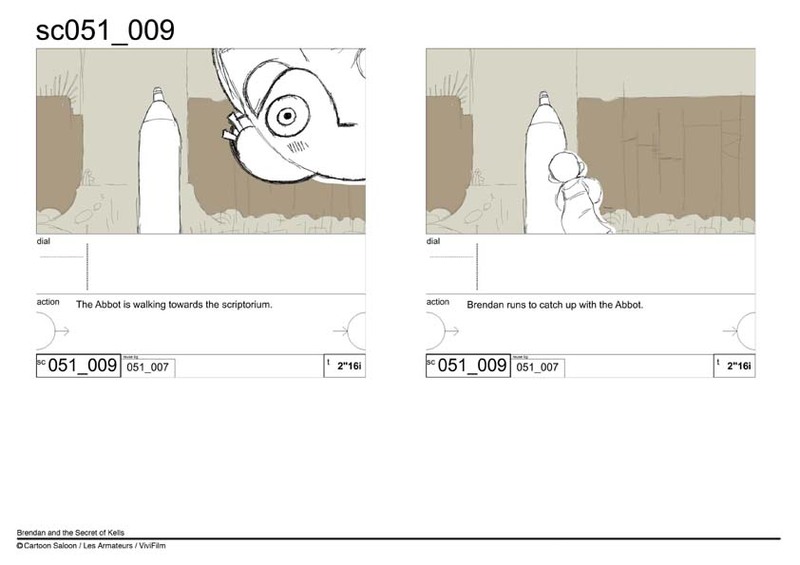 Their are parts in the film that the actors really liked, and which i guess could be done in live action but I'm really hoping that overall its gonna be something ONLY acheivable in handdrawn animation. But with the voice performances in the bag it feels like we are off to a great start. Tús maith leath na oibre as the man says. So Belgium was Oefti. Seems like a lot of good solutions can be found with the software of the Freres Ume and they have a beautiful studio in Liege. It was good to see Eric, Vivanne, Toon and Benoit. The kids were down yesterday for a workshop day, they are lovely kids and we had fun showing them all the stuff. It was great to see their reactions to the animatic, them being the target audience age and all. They did a little read through together and they are both very professional and easy to get along with. It was good to have them meet each other and see the studio and stuff ahead of the records next week. I'm a bit nervous now, but we are as prepared as we can be I guess and I'm hoping it'll go well. I'll be heading off to Bray now in a few minutes, theres a whole big gang of us going to be there so we'll have some fun too I hope. Well, fingers crossed , next time I write a post we'll have the final voices in the can! Faster faster take me to your master! Yeh things are going really fast now. Didier , Fabrice, Ivan and Bruno Coulais came over on Tuesday. Bruno seemed really into the artwork we showed and felt the story was working in the animatic. He is a really nice guy and we feel lucky that he'll be working on the music. Katia's fella organised a great night of trad music in the Pumphouse on Wednesday night and everyone had a blast. The craic was mighty and Bruno seemed really into the Irish music. We hope he will be back for the Willie Clancy festival. 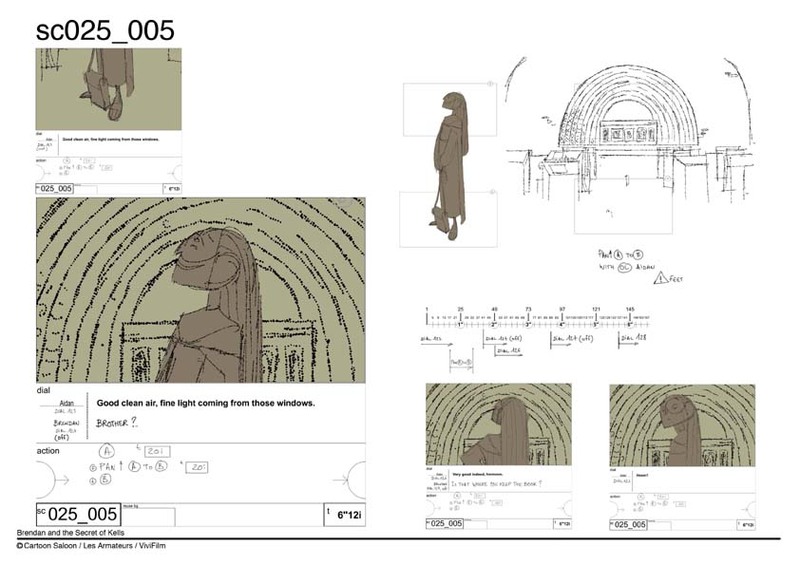 He's gonna do a temp track based on the rough stuff Nora put down on the animatic and thats really exciting - to have feeling for the score up front. Hopefully it will be inspiring for the animation and all too. We had a party for both productions here in the studio while the guys were here and it was quite overwhelming to see all the crew - or most of it anyway in one room. 40+ people, thats some amount after years of never really being much more than 10. Cuilin seemed like a big crew for us last year! Anyway the records are soon and we need to cast the final voices for the additional monks. We will have the kids down on Saturday for a workshop day. Then we are meeting Brendan Gleeson and Mick Lally on the Sunday and on Monday we begin recording! It'll be hectic , but Fabrice is gonna come over again to help with the voice directing as he's doen that before. He had some good notes on the animatic too - just tightening up lines and so on. Tommorow I'm off to Belgium with Nora, Martin and Remi to meet the Belgian crew and work on the ink and paint tests. Its gonna be a busy few days and then we're back just in time for the records. Layout is baring down on us with the crew starting in June, I'm gonna be boarding at least until end of July so its getting like spinning plates on sticks kinda thing. Its a bit stressful alright but we're getting there. I think things are still looking pretty good and if the voices are good it'll be a huge leap forward. Didier was really cool about the blog - I was a bit worried he would'nt agree with it, but he thinks its cool. He's into linking it with the marketing site that we'll launch in September. Adrien and Lilly have a cool idea for a Brendan game that'll be on the site so that should be cool. Fabs will be helping out with the voice breakdown and we are gonna be up to our eyes for a few weeks after the voice records. He's been doing soem gorgeous scenes as testers - just little chunks that are silent and don't need the final dialogue. I've been thinking its a little less stylised animation wise than we first envisaged but looking very well. He's flying through it so thats a good sign I hope . Just hard to get my head around the fact that by Christmas all our animation will be done and the layout will be finished. All the remaining work will be overseas by then. As Katia says - once you enter the layout phase its like entering another dimension....yikes! Anyway Ben is beside me here getting fed up so I better go!! Got thru' very little boards , its getting slower and slower as we get busier and busier. Anyway its still going forward and the current system with remi doing a layout pass on the boards Nora and I do is working really well. Finally got some closure on the main part of the Irish finance which is nice, its a drip by drip process but we are in a much sturdier place now. Emm,deadlyBgs by Stewie , Adrien and Lily this week - starting to see the more creative Bgs that are part of the more lyrical parts of the film that I'd been looking forward to and now I'm on the forest part of the boards its fun to be opening up outside of the confines of super tight continuity issues that we had to respect "inside" Kells itself as a location. Its funny, at this point I almost feel like I could walk around that space, and although theres loads of artistic license in the style we picked, it feels consistant when I scroll through the 100 or so Bgs or "scene illustrations" that we've done so far. Eve, an intern from France, has done a beautiful job on a layout test Remi set for her and we are hopeful she will be able to join our team for a while this summer. Raining cats and dogs these days you'd swear it was'nt summer at all. We are probably recording the voices the last week of this month now - trying to get Mick and Brendan Gleeson into the studio at the same time is tricky as they are both busy. We hope to bring the kids who will play Brendan and Aisling down for a workshop one of the weekends between now and then. Martin has been cleaning up the modelsheets for Cellach recently -looks classy. But Barrys drawings are so tight that its kind of easier than normal he says. Theres no redrawing going on between the rough and the clean its just all about the line. He's a bit of an illuminator is our Martin! The thing with good crew, I can't say it enough, is it makes it seem almost easy somedays! Remi often spots important stuff on the boards too or suggests really cool alternatives that I did'nt think of when I was plowing thru' a second pass of a scene. Theres a lovely frisson of jealousy and awe and a bit of gratitude and probably loads of other stuff when you see people taking your stuff and going further and making it better than you would have on your own. I know Disney DVDs are full of this kind of praise and it usually makes me cringe but there you go, its just a fact. I was at a "artists day" today in the Castle in Kilkenny- just a networking kind of day with workshops and all. I did a writing workshop, one of the speakers was a novelist that used to write for tv, He wrote on that great puppet show from years ago that I loved as a kid - "Spitting Image". Its mad the heads there are around Kilkenny. Liselott and Nora and Mike were there too. |The castle is a class space, big old beams and stone walls. Maybe in a year or so we'll have a preview screening there or something! Teddy Newton from Pixar gave a talk there last summer as part of Feile Beochán - the Irish animation festival that Ross John of the Murrays ran with Kairen Wailloch. Didier Brunner the French Producer, Fabrice Ziolkowski (all round cool cat and screen writer) , Bruno Coulais (the composer from France) are visiting this week. Sure it'll be great craic. Probably won't get much boards done. We recieved some ink and paint tests from Belgium yesterday , looks great to see some coloured animation. Nora, Martin and myself will head over there week after next to see the crew there and work thru' some smaller issues that are easier sorted face to face.